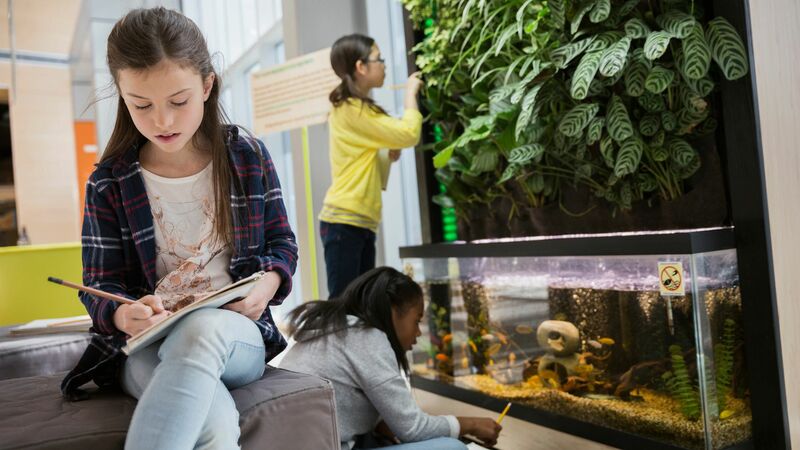 Three exercises to get students writing with vivid detail—a key step to developing a distinctive style of their own. How do authors draw us in with their prose? What does an article or book do that makes us nod along, laugh out loud, or shout, “What?” Used well, a writer’s words can speak inside us. How do we develop a student writer’s voice so they can have the same effect on their readers? A writer’s voice is a combination of many factors. The 6+1 Trait writing model, for example, focuses on ideas, organization, voice, word choice, sentence fluency, conventions, and presentation. Developing all of these factors requires ongoing workouts to grow and build confidence in one’s writing voice. Strive to have students write every day. The length may vary, from three to 40 minutes, depending on the curriculum-related experience. Here are three exercises that can be used frequently as writing practice. This exercise gives students practice with details, especially sensory language: sight, sound, smell, taste, touch. Introduce this in the classroom to teach the process and answer questions regarding the skills students will practice. Once the process is understood, take students to different parts of the building and outside to provide them with different scenery to capture in their writing. This exercise has four steps. Pick a location or object that you want to capture in a portrait. In a classroom, this may be a wall of posters, an animal cell or habitat, or items on a table. Outside of the classroom, the chosen focus should be rich in sensory qualities. Students should pick their topic. Capture sensory notes about the chosen focus using all five senses. Students should capture two or three details that fit each sense. These notes can be in any format of the students’ choosing. Often, they make a list. Early on, it’s helpful for students to label the senses after completing their notes to ensure that they have the required number of details for each. Display the portraits. Publication is important to portrait writing. Having a public audience signals to students that their efforts matter. Publication can mean a public reading, posting in the hallways, and/or being published on a blog or social media tool. Using three out of the five senses in a writing assignment can make the reading more appealing to readers. Painting scenes and descriptions with words is one way to draw a reader into the writing. “Show, don’t tell” is an adage that writers often hear. But what does that look like? This exercise gives practice in developing understanding that can be transferred to all types of writing. Have students do this exercise as a warm-up to an author study or as a follow-up to modeling an author’s style. Take students outside of the classroom, preferably outside the building. The location needs to have lots of items that are varied to choose from. Some examples are the parking lot, the playground or cafeteria immediately after lunch, or the school entrance area. Make an inference about how the object got there. The above example’s final sentence makes a guess, based on the evidence, as to the reason the car was parked facing outward. The object is never named. The description provides clues that allow the reader to infer an answer. What kind of car is described above? Publish the work so that others can solve the riddle. Readers and listeners should be able to guess the object based on the description and inference. Publication can be in small groups, the whole class, or online. In So All Can Learn: A Practical Guide to Differentiation, I address writer’s voice with the ThinkDot strategy (in which students are given six activities marked with one to six dots and roll a die to select which one to do first). In this example, the teacher designed two versions of the assignment—one more complex than the other. Students were assigned the one that best stretched their skills appropriately. Working in groups, students built a shared understanding of voice, and how to find theirs. Using these strategies for frequent practice helps students hone their voice. Start with three- to five-minute portrait writes. Sprinkle in Inference Riddles and ThinkDots for a change of pace. Over time, students will build writing stamina, and their confidence in their voice will grow. The results will make their future teachers, employers, and the students themselves happy.